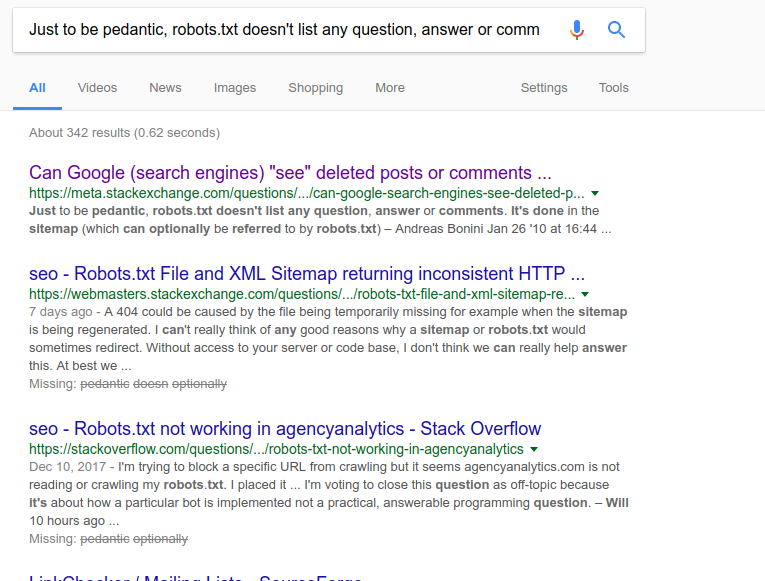 Are comments made on SE sites indexed by Google? Or is the site configured in such a way that only questions and answered are "seen" by Google robots? I know this question appears related, but its text doesn't mention comments even though its title does – and none of the responses address comments. You can prove this by finding any random comment that has been around for awhile and searching for it in Google. It will appear in the search results. Google will (naturally) prioritize posts to comments, but it will search comments if there is a far closer match than there is in posts. Point 3 under "Scraping users’ profile", "Nothing about this transfers any rights from our users to us" seems to include the implicit understanding that SE already has the legal ability to allow access to that information. Not the answer you're looking for? Browse other questions tagged support comments google search-engine .